I have been reading your responses to several questions on this book. In one answer you say that the Pathwork doesn’t treat addictions or so, and in the same answer you say that you have found the MotherGod in the Ayahuasca, and that the Pathwork is not any more your path. I understand and believe that a profound spiritual experience, will help you to leave the addictions , as it happened with founder of AA. But I don’t agree with you about Pathwork and addiction: Me myself was deep in addictions when I entered the Pathwork, and only with it now I have almost 12 years completely free from any addiction, I just have an event in the middle. But the Pathwork give me so many tools, first emotional growth to face any reality, second to know my different inner voices and , and become and observer and a listener of them, questioning them, and finally to wake up my higher self, who healed my sick parts, and also understands the influence of certain spirits, but most of all, the certainty that God will help me, if I ask. This is something very brief but I am totally healed , Another thing you say is that with ayahuasca you meet the MotherGod and merge with Her. I also did that with the Pathwork even though in Mexico the Pathwork is more Psicological than spiritual. And finally I understand the Pathwork as an endless path , very clear defined, self purification, so is impossible , if you want to reach God, to quit it. We know that the name Pathwork is just a name, but self-purification is the Path I speak Spanish, dear Susan, so sorry if I wrote wrong , I will appreciate so much your answer, love ! Thanks very much for your letter. I am so happy that you were able to find in the Pathwork the tools you needed to get sober/clean and stay with your sobriety. I’m very impressed! In my (personal, limited) experience the Pathwork works best with people who have a strong enough positive ego development to be able to face their shadow side. Sometimes in the past we did a disservice to people who really needed either more traditional psychotherapy to build a stronger positive ego before they did more Pathwork, or they needed another path, such as AA and 12-steps, to deal with their serious addiction before they did more Pathwork. My experience with the Pathwork in North America has been that deep, entrenched issues of addiction, spirit possession, and/or serious mental illness have not been healed by the Pathwork alone. But the Pathwork was the crucial background for my healing and, through me, for my daughter’s healing from addiction. Without Pathwork I cannot imagine where we would be as a family. It is the ground we stand on. But it was, by itself, not enough for our daughter Pam to break through to a spiritual perspective on her addiction. Incidentally, as an historical note, when people with an active addiction came to the work with Eva Pierrakos, she always required that they join the relevant 12-step group in order to work with her. So from the beginning of Pathwork there has been this recognition that something more than Pathwork was needed to treat addiction. However, you have brought something new to my experience, and I am so glad to hear of your personal success with the Pathwork in dealing with your addiction! When someone is in the active grip of mental illness, spirit possession or addiction, the negative unconscious has often eclipsed the person’s ability to look at themselves objectively and with compassion. Then something else is needed. It could be psychotherapy or 12-step work or it could be some kind of strong spiritual medicine. What is needed is something that can break through the hold that the negative unconscious has on the personality. Bill Wilson (who started AA) had a strong spiritual opening. It can come from anywhere, anytime, any place. I am truly delighted to hear that, for you, this spiritual opening came through the Pathwork. It is very encouraging for me also to know that your work in Pathwork could bring you to the level of surrender to the MotherGod (as you put it) that can transform an entrenched addiction. Vivas to you and the Pathwork of Mexico! Having worked in Brazil in the Pathwork I know that South American Pathwork is much more open to working with spirits than is generally true in North America. Maybe Mexico is really more South American than North American! Remember that my book Love Unbroken tells only our particular story. I cannot generalize about what works for anyone else. Our daughter was in no way ready for either traditional psychotherapy or the Pathwork when she started her downward spiral into addiction. In fact she wasn’t really ready for ayahuasca, but we tried it anyway, out of desperation. It happened to be what she needed. The spirit of the ayahuasca reached deep into her in a way that nothing else had done, so that she had her first glimpse of spiritual reality, and of her capacity to heal. It’s just what happened. That does not mean that I am recommending it. I am not recommending to anyone the path we took. In fact, I specifically do NOT recommend it, if you read the Disclaimer at the back of the Love Unbroken book. Ayahuasca is CERTAINLY not for everyone. And it is NOT a cure for addiction. I totally agree with you that the path of transformation is endless. I work every day with the tools the Pathwork gave me. There is no way I could ever stop looking at what arises through the eyes of the compassionate objective Presence which is always here. That presence first awakened in me in the form of what I named in The Undefended Self as the compassionate objective observer “self.” I wouldn’t call it that anymore, because it sounds like a separate “self” which is not how I see it anymore. It is more like the ground of Being itself which is compassionate and objective by nature. Please try to understand about “being on a path.” I am saying only that at the present time I no longer identify with any one path—Buddhism, the Pathwork, or the Daime path–or anything else (though each has played an important role for me, the Pathwork being the most important). Paths are designed to lead the person following them to a reality that can only be pointed to, never defined or captured by any one path. When that reality has been experienced, the idea of being a Pathworker or a Daimista, or a Buddhist or anything else, simply no longer makes sense. That doesn’t mean that I disrespect any of the paths. Certainly I do not disrespect the Pathwork. It will always have a very tender place in my heart as the path that helped me the most. 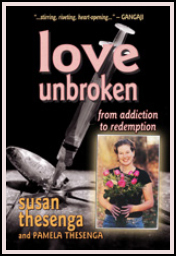 You might be interested in reading my spiritual biography on my website, www.loveunbroken.org. It is posted in English and in Portuguese. That explains it better than I have done here. I am happy to know you (we’ve talked electronically before I believe), and so happy you have found what you needed in the Pathwork of Mexico. Felicidades! Hello dear Susan I write you again my last answer, this time trying to do it better. I want to tell you that I understand what you lived with Pamela, she is my face friend and I appreciate her very much, as I appreciate you, and I think that taking that path with Ayahuasca was the will and the help of God for all of you. I respect it, it is a beautiful way of God. For me even though I didn’t have a strong ego, as I started my spiritual journey long before the Pathwork, with some Lamas from Tibet, 20 years before my addiction crisis, I had a very strong faith and a natural way to contact my higher self. But in those times I was like a pendulum–moments of light and moments and expressions of my immature self, so in order to see my dark side I had to hold on to my faith and my higher self, until my ego grew up. Of course I had a very good helper too, but she also said to me, the Pathwork is not for addictions, go to AA. But I was sure that if I awake my higher self , and that if I mature my inner child I will heal myself, and with all humility I tell that I did it, everybody in the Mexican Pathwork was surprised . I can’t say either that the Pathwork heals addictions, but I think so, and with me it worked. Te envio mucho amor Susan, I have walked with you and your husband in the same road that you also have walked, but if I did it, it was because you have the light to produce that 2 beautiful books that in the middle of the darkest night they came to my hand, to my soul, first in the middlle of party “Fear No Evil” and 3 months later “The undefended Self” they were my rope, when I finished your book asked God with all my hart to take me to that Path, and I went. I saw that if I went through it, I will be free again, innocent again !